Eczema is a chronic problem for 35 million Americans, and at least 17.8 million of those consider their eczema or atopic dermatitis moderate to severe. The prevalence of childhood eczema / atopic dermatitis in the US is 10.7% overall and as high as 18.1% in individual states and 21% across various countries. Approximately one out of every three children with eczema / atopic dermatitis has moderate to severe disease, and about 60% of infants who have eczema continue to have one or more symptoms in adulthood. Eczema is a general term for any superficial inflammatory process involving the epidermis primarily, marked early by redness, itching, minute papules and vesicles, weeping, oozing and crusting, and later by scaling, lichenification and often pigmentation. The word eczema comes from the Greek word “ekzein” meaning to effervesce, or bubble, or boil over. It is a form of dermatitis and can be used widely to describe any rash-like skin conditions. It is usually used specifically to refer to the most common type of these skin conditions: atopic dermatitis. Atopic dermatitis is a chronic skin condition that commonly starts during infancy and continues through into childhood. Some people outgrow the condition while some people will continue to have it into adulthood. It can disappear for years and then reappear as an outbreak when the conditions are right. Eczema may be a different experience for each person. It may even look different or affect different parts of the body from time to time. The rash can be mild, moderate, or severe. Generally, people with eczema suffer from dry, sensitive skin. Eczema is also known for its intense itch. 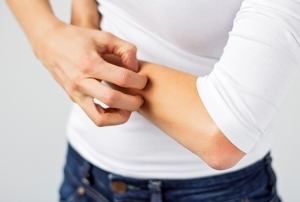 The itch may be so bad that a person will scratch their skin until it bleeds, which can make the rash even worse, leading to even more inflammation, more itching and scarring. This is called the itch-scratch cycle. It is helpful to be aware of those that make you more sensitive to eczema and remove them from your environment. NeoGenesis products contain the patented S²RM® molecules that naturally heal the skin, delivering nutrient rich molecules to the areas of inflammation. By providing the best climate for healing, calming and hydrating the skin, areas of inflammation are reduced, allowing symptoms to subside. The topical application of our advanced product Recovery, abundant in S²RM® molecules, will help with the rash, inflammation, and itching, and help to break the itch-scratch cycle. Follow Recovery with our Intensive Moisturizer and apply as often as needed to calm the skin. Use Recovery, on cleansed skin twice daily, until the skin is healed. Recovery is safe for use on all areas of the body, including around the eyes. When combined with the important management of environmental factors, NeoGenesis can aid in healing the skin and reducing or eliminating the redness, swelling, itching and general discomfort from eczema. For ongoing comfort and to reduce the chances of the eczema reappearing, the patient may transition over to the use of our NeoGenesis Skin Serum once or twice daily, followed by the application of our Intensive Moisturizer. Our S²RM® technology found in Skin Serum and the Intensive Moisturizer will continue to naturally feed nutrients into the skin. This creates healthy layers within the skin and a stronger, improved skin barrier. The healthier and stronger the skin is, the less chance of inflammation recurring from eczema. 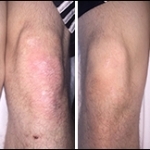 “I started getting Eczema on my elbows during the winter months a few years ago. I tried a variety of different lotions and prescriptions, most didn’t help, and the outbreaks would last an extended period of time. At the end of the summer this year, I had another outbreak, and all the different lotions I tried didn’t help at all. I received a bottle of Recovery and used it 3-4 times per day, and the Eczema was completely gone in 2 DAYS! Best of all, the Eczema has not returned. 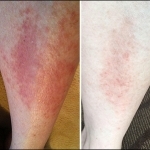 “I have suffered for over 20 years with a leg rash that was eventually diagnosed as eczema. I thought for sure I would never be able to wear shorts or a dress. I tried everything that was available, from Dr’s RX’s to professional Spa products with no change or effect. But after finding and using the NeoGenesis Recovery Serum for only 2 months, it has disappeared (and stayed gone now for 5 months). No more red, no more itch and now I am only dealing with some leftover hyper pigmentation.